UR44 Stereo + Subwoofer routing ? I haven't been able to do this inside windows or inside Cubase 9.5. 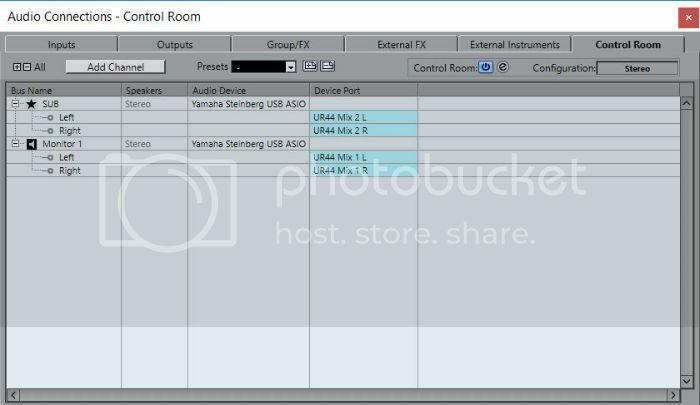 I was hoping this would be a simple task - previously all my M-Audio cards had a pretty intuitive way to accomplish this, but I can't do it thus far with my UR44. Re: UR44 Stereo + Subwoofer routing ? I don't have a solution for discreet (and volume controlled SUB out) when using the UR44 in Windows! But, I have found one way to accomplish this while using Cubase 9.5 - not the most elegant solution but at least it works. Works pretty well for my purposes.